I'm back. I didn't take the month of October off from writing altogether, but I did take a break from the "30 Days" series. Now it's November and I am ready to embark on another 30-day journey. This time, I am going to spend the 30 days in the cloud. I love my Windows 7 PC, and I'm attached to having software locally installed. I like knowing that my software is right here where I need it, and that I am not dependent on a reliable Internet connection just to access my own information or get anything done. I don't like the fact that a server outage somewhere on the other side I know that way of computing is quickly becoming outdated, though. I also realize there are many potential benefits to using cloud-based products. As much as I appreciate having my software and data stored locally, there is an advantage to having access to my tools and data from virtually anywhere as long as I have a Web-enabled device and an Internet connection. If my PC crashes, or gets dropped in a pool or something, all I need to do is buy or borrow another PC and I'll be in business as if nothing happened. As much as is possible, I will rely on Web-based tools. I can use the cloud for productivity software like word processing and spreadsheets, keeping track of my finances, scheduling and tracking my calendar and time, storing my data--including my music library, or just using a cloud-based music service in lieu of my library. There isn't much I can't do from the cloud these days. Part of the journey will be devoted to trying out different tools and services of a given type and choosing the one I prefer. Then, the rest of the 30 days will be devoted to just using the cloud services I choose, and chronicling my experience--what works and what doesn't, as well as tips, tricks, pitfalls, and shortcuts. Some of the cloud-based options are obvious, like Google Docs and Office 365, or Gmail and Hotmail. If you have any Web-based tools and services you use, or just suggestions for tools you are aware of and might like to know more about, send me your ideas. I can't promise I will get to them all, but I appreciate any input you can provide to help me find some of the more obscure "diamond in the rough" options. So, let's get started on the 30 Days With the Cloud journey. 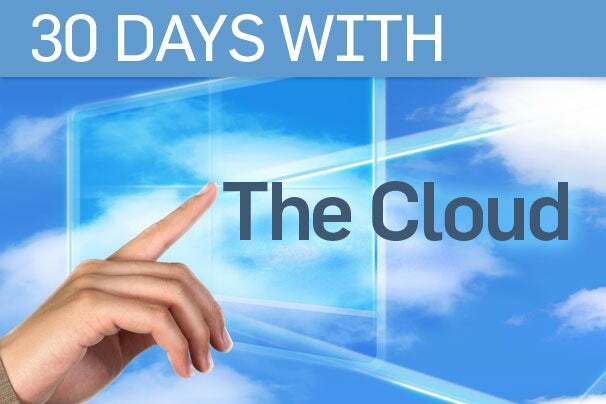 Go to Page 2 for a complete list of links to the "30 Days With the Cloud" entries.